We have started our kitchen preparation for long and hot days that definitely demand less cooking, and more enjoyment in the form of refreshing snacks to go. 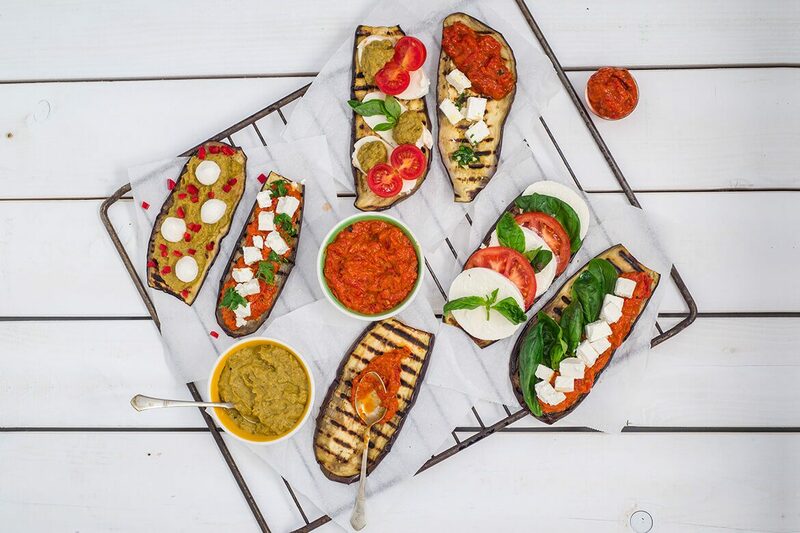 Whether we go for a trip, to the beach, or an improvised picnic at an office desk, when we think about food to go, it’s important to us that it is made with ingredients that will keep the freshness and good taste for a long time, and of course prepared and packed simply, easily and quickly. 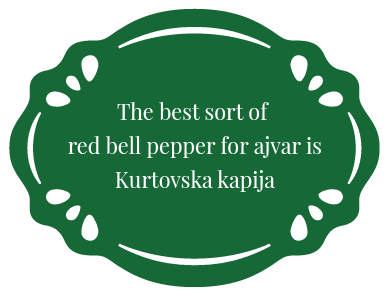 As a food with a rather compact texture, genuine home-made ajvar is extremely handy for take away. As it has just a few calories, it’s also our favorite during summer when we don’t want to overload our body with food. Nevertheless, its greatest trump card is a specific taste turning apparently ordinary, fresh, seasonal food into a real feast for all senses. To begin with, we’d like to recommend that you try one of our trump cards, veggie burgers. Being increasingly popular all over the world, veggiee burgers are a light and highly nutritious meal, ideal for hot days. We prepared them in two ways. Burgers with beans and lentils with ajvar and mushroom burger with ajvar have definitely assured us that burgers don’t have to be exclusively meat-based in order to make us enjoy a delicious snack. 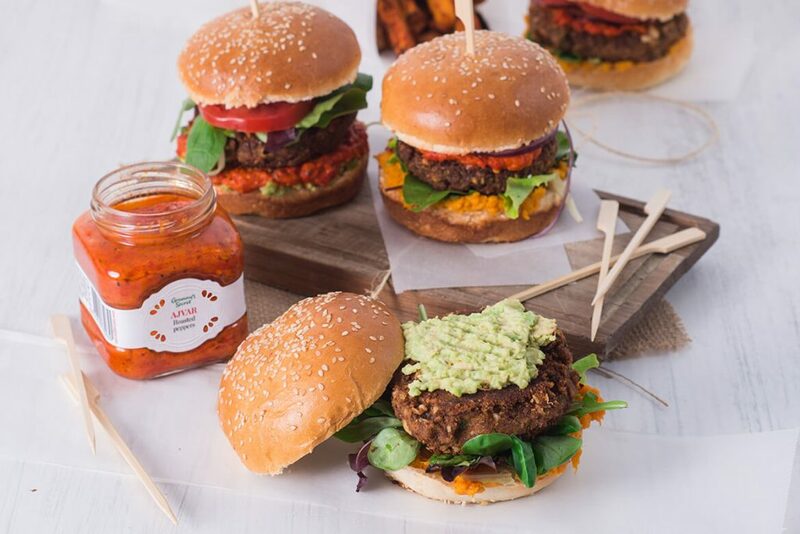 The base of our veggie burgers is made up of different legumes, cereals, almonds and spices, to which we have added ajvar to emphasize all these wonderful tastes and make them particularly succulent. Ready in about twenty minutes, packed with fresh salads and vegetables and served with crunchy sweet potatoes, these colorful tiny packages, we can confirm, induce a widespread ovation and quickly gather loads of people. It’s up to you to make a little effort and ensure you have them prepared in sufficient quantity! Sandwiches sound like the obvious food for on the go, and with properly chosen and combined ingredients that finely rest between two slices of bread, they can be a well-balanced, complete meal. And delicious, of course, but it somehow, for us, that goes without saying. Here we tried to break our sandwich routine, so we’ve prepared them in several new, refreshing ways, just as inspiration. Feel free to explore further and play with different tastes. 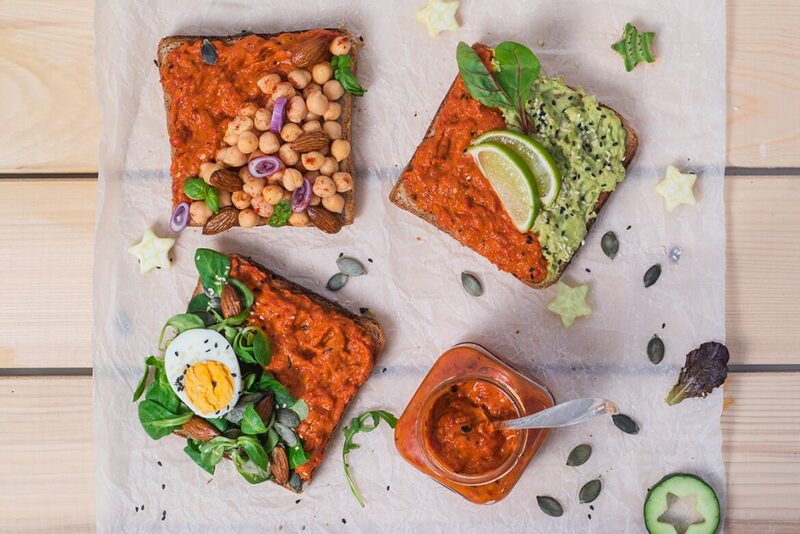 Chickpea and ajvar sandwich with olive oil is in fact a real gastronomic pleasure taking only about ten minutes to prepare. The secret of this seemingly ordinary sandwich lies in the combination of ingredients and the way of preparation making cooked chickpeas irresistibly crunchy and aromatic, and red onion sweet-sour-salty caramelized rings. And for all those moments when we just don’t feel like turning the stove on, just for the record, this sandwich is also super tasty if you simply arrange cooked chickpeas together with other ingredients between two slices of bread. 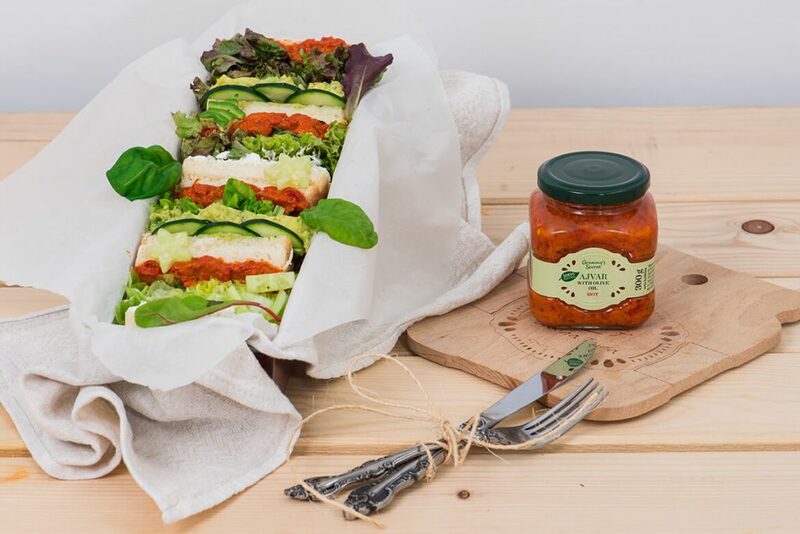 Ajvar and avocado and basil spread sandwich filled our kitchen even during the preparation with fresh, citrus scent of lime and intense scent of basil. 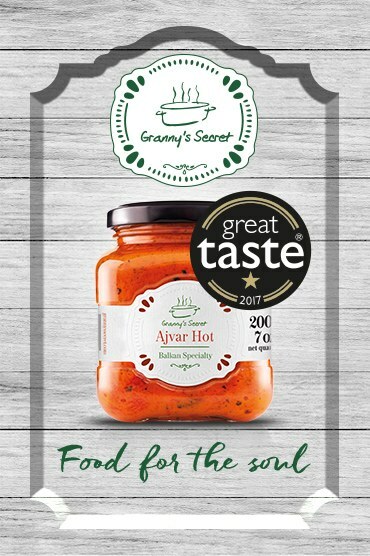 As for avocado and ajvar, we have already confirmed so many times that they are a fantastic duo, so you should try them together, if you haven’t done it yet. Avocado spread, recipe for which we give you here, you can make in batches and store in the fridge in a glass container. 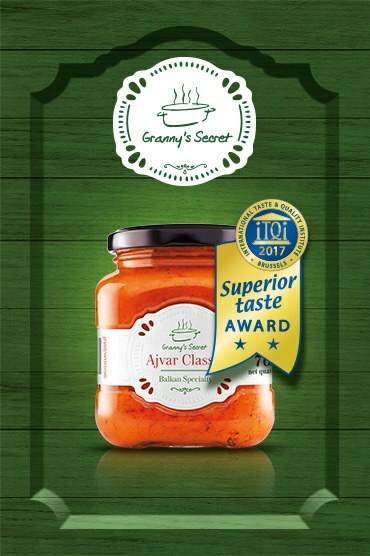 If you were wondering if ajvar can be combined with fish, we’ve tried that and can say that yes, it definitely can be paired with fish! Of course, it’s best to try it for yourself, and we recommend salmon and ajvar sandwiches with olive oil. With a little arrangement and some fine pastry, you can easily convert this combination into an elegant canapé for evening gatherings. Aromatic cheese, ajvar and crispy green vegetables sandwich is already a classic, so we’ve enriched it with fresh, scented spices. We used basil and oregano, and you can make your favorite combination of this sandwich. 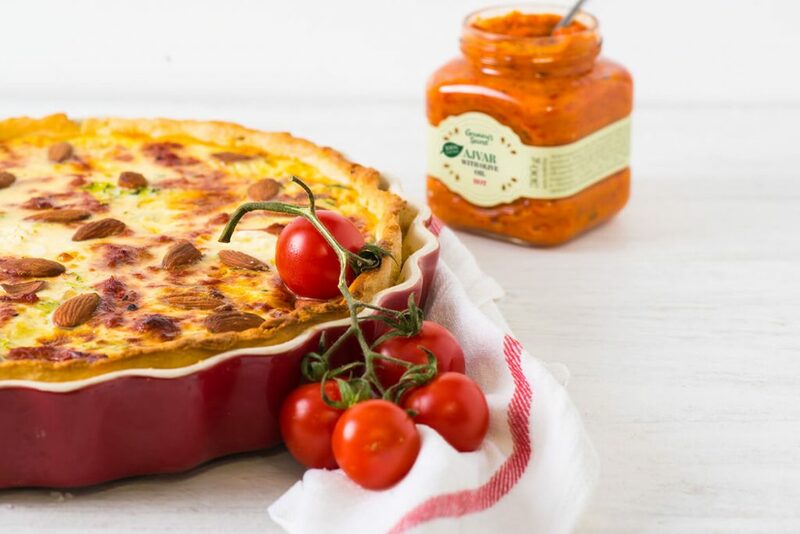 In addition to new recipes, in our section Recipes there are many more suggestions perfectly convenient to pack and to go, such as aromatic ajvar salad, grilled eggplant with ajvar, colorful vegetable bowls or lent pastries and many others that we invite you to explore, try and adjust to your taste. Most important of all, we invite you to have a good time in the kitchen and enjoy summer days to the fullest!